In the first part, we created a webdynpro application which consists of one window and one view. In this part of the series, we will concentrate on how to build an application having more than one view and achieve the navigation between different views. Before going into the details of the development let us first understand some of the concepts used in creating the navigation. Navigation between different views is enabled by plugs. These can be divided into inbound and outbound plugs. 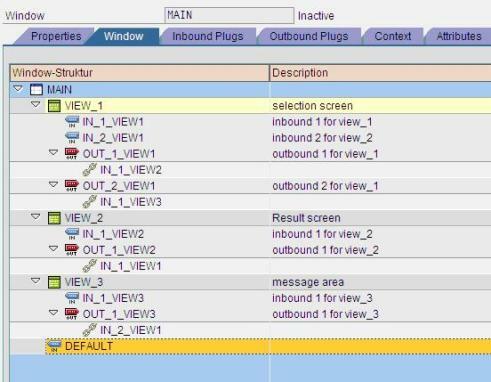 While inbound plugs define the possible starting points of a view, the outbound plugs of a view can be used to call a subsequent view. Plugs are part of the controller of a view. They are always assigned to exactly one view. 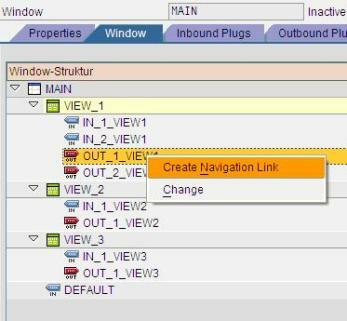 To navigate from one view to another, each outbound plug from the first view must be linked with an inbound plug of the second view with the help of a navigation link. Note: A view can have multiple inbound and outbound plugs. Now coming to the development, the below schematic diagram depicts the navigation between different views in the application. The application will have one window MAIN and three views VIEW1, VIEW2 and VIEW3. The view1 will have two inbound plugs ( in_1_view1 and in_2_view1 ) and two outbound plugs ( out_1_view1 and out_2_view1 ). 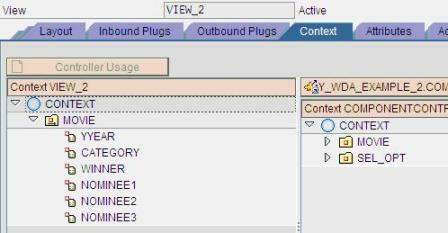 As soon as we create an inbound plug an event handler method with the name HANDLE will be created in the methods tab of the view. Similarly the views view2 and view3 have one inbound and one outbound plug each. After the creation of all the plugs, we need to embed the views in the MAIN window. In the subsequent window select the view to be embedded by choosing F4. In the similar way add view2 and view3 also. 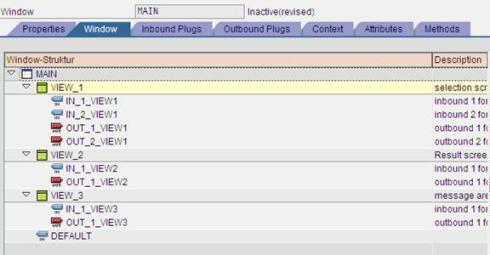 Similarly for the second outbound plug of the view1 assign the inbound plug of the view3. Also, connect the outbound plug of the view2 with the first inbound plug of the view1 and outbound plug of the view3 with the second inbound plug of view1. Note: The symbol represents the navigation link between the inbound and outbound plugs. 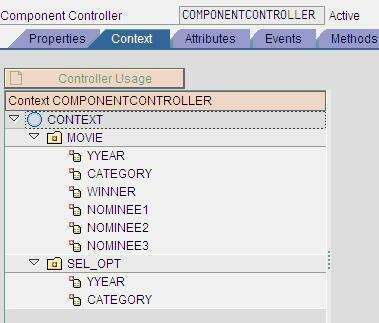 We will now move to the creation of the context for componentcontroller and view controllers. As the creation of the context nodes had been explained in detail in the first part of this series , it is not explained here in detail. An event with the name onclick is assigned to the button “search”. The code for the corresponding eventhandler method is given below. 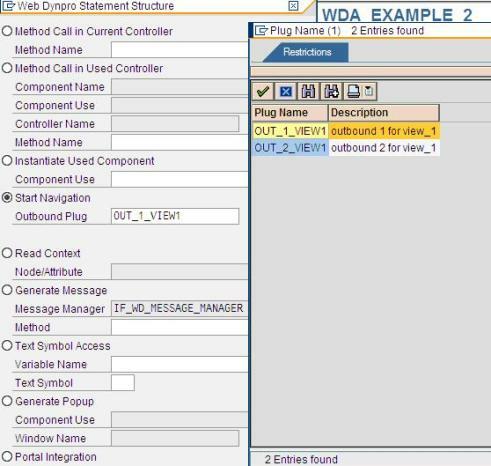 TABLE_NODE type ref to IF_WD_CONTEXT_NODE. Node_Sel_Opt = wd_Context->get_Child_Node( Name = wd_This->wdctx_Sel_Opt ). TABLE_NODE = WD_CONTEXT->GET_CHILD_NODE( 'MOVIE' ). To generate the code (highlighted in blue color) which actually carries out the navigation between different views, we use the code wizard again as shown below. The context of the view2 contains the MOVIE node copied from the context of the componentcontroller. 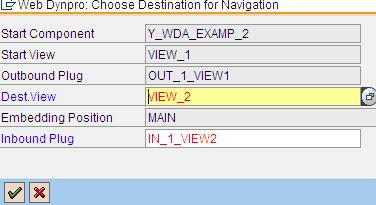 View2 has a button with the name “view2->view1” which will trigger the action view2_to_view1. The button “view2->view1” takes you to the first screen. If we enter the year and category combination, which does not exist in the table YMOVIE the message appears in the different screen and the navigation from this screen is achieved by the button “view3->view1”. I have done it by using message with variables and populating the variables with the year and category values. I am not getting the table values in View2 eventhough I have put the code in the ‘Search’ button event appropriately. Do I have add any code in the Event Handler method HANDLEIN_1_VIEW2 ?